Later this year, the FDIC, the Federal Reserve, and the Office of the Comptroller of the Currency will decide whether to increase the threshold for residential real-estate transactions requiring an appraisal to $400,000, from $250,000. Is insufficient cost data being used to determine the benefit of raising the threshold? In identifying cost data or analyzing the potential cost benefits of raising the threshold, regulators have relied on schedules of appraisal fees prepared by the Department of Veterans Affairs. It has requirements for appraisals that exceed the Unified Standards of Professional Appraisal Practice requirements, which means the cost of producing appraisals is inflated. Why do the regulators fail to recognize the value of alternative appraisal products? There is no mention of a range of appraisal products between the Veterans Affairs appraisal and evaluations which are not a full physical appraisal, such bifurcated, hybrid, desktop or limited scope appraisals that may be appropriate to the underwriting if lenders are given more latitude. These would reduce costs while still retaining the services of an appraiser. Why is there no allowance for regional or localized effects? A $400,000 house is the exception in many markets while, at the same time, common in California and other high-value markets. Rural banks that lend to farming communities may be adversely impacted by external factors that affect rural economies, such as crop values. Simply setting one appraisal threshold without considering local impact might create a safety and soundness issue for some local or regional banks. Why do the government sponsored enterprises require appraisals on the vast majority of loans regardless of loan amount? The GSEs have not adopted the practice of the agencies, and they still require appraisals regardless of loan amount with limited exceptions for their “waiver” programs. Most appraisal waivers granted by the GSEs are driven by pre-existing data they own on the collateral. While the GSEs have publicly stated that they are considering the use of alternative appraisal processes and products, they have not set defined thresholds based solely on loan amount. In short, the threshold discussion is being viewed as a binary decision vs. a spectrum, with many variations that might color the decision. While regulators may be over-inflating the cost savings of increasing the threshold, they certainly are neglecting to consider the implications of bifurcated, hybrid or desktop solutions that would offer lenders a customized selection of appraisal products and services to minimize risk, no matter what the threshold is. For lenders, a higher threshold would be almost all positive. Although rates have been coming down over the past few weeks, a return to rising interest rates might inhibit lending growth. 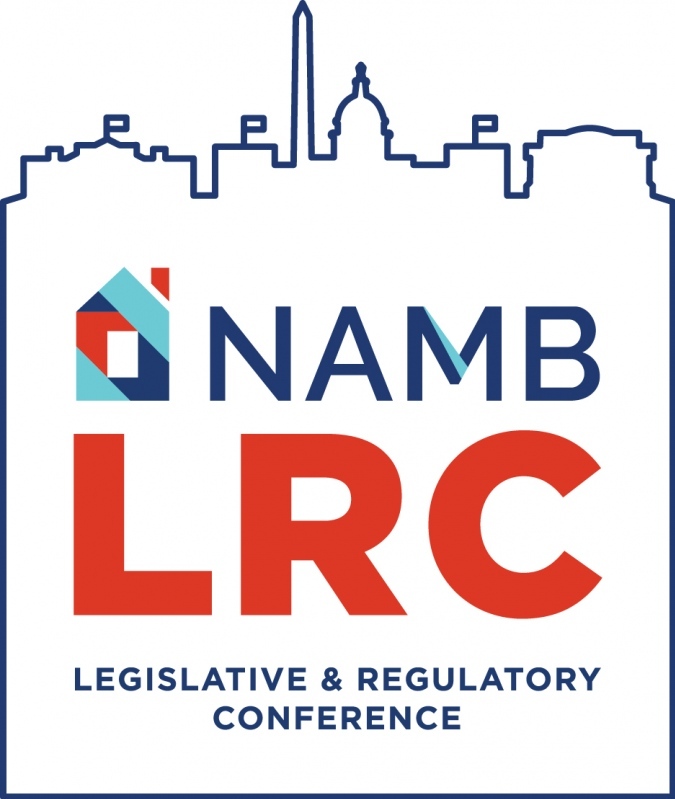 Lenders need to find efficiencies to save money and improve the borrower’s experience to compete more effectively in a changing marketplace. 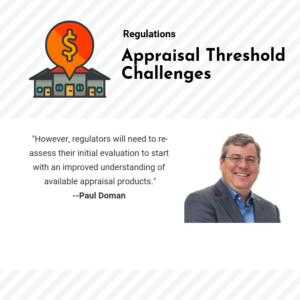 For appraisers, a higher threshold could reduce the number of appraisals needed. Less volume could negatively impact appraisers and appraisal companies. But this also represents an opportunity for forward-looking appraisers or appraisal companies to optimize technology and to deploy bifurcated appraisal solutions that would enable them to scale to meet the needs of their lender clients and capitalize on well trained, experienced, appraisers. Allowed access to a full range of appraisal solutions—e-valuations, desktop appraisals, hybrid-bifurcated appraisals and traditional appraisals—the most innovative appraisal management companies stand to benefit from a threshold change. Bifurcated appraisal solutions—the so-called desktop or hybrid appraisal—enable an appraiser to complete more appraisals because technology and the use of local property inspectors alleviates the need for the appraiser to be on site. 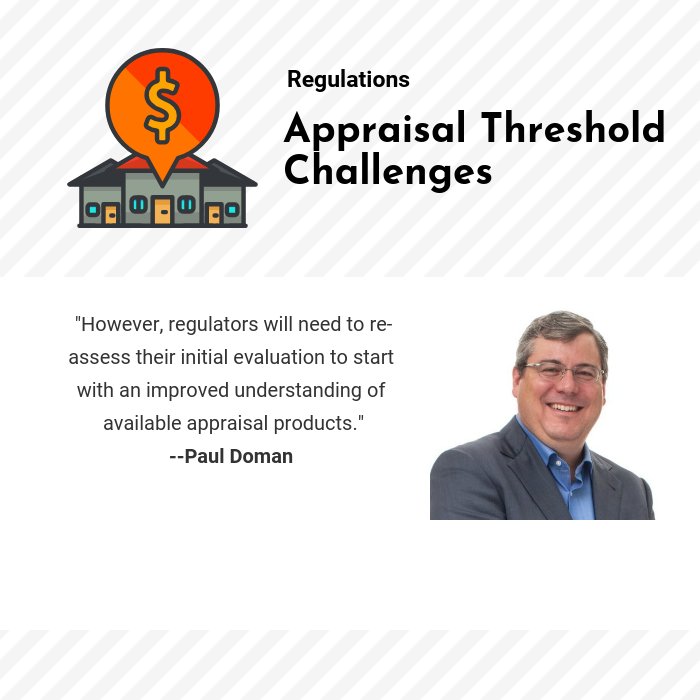 The result is the ability to complete eight to 10 appraisals a day compared with two or three for an appraiser in the field conducting traditional appraisals. Raising the appraisal threshold is likely a positive for the industry. However, regulators will need to re-assess their initial evaluation to start with an improved understanding of available appraisal products. That could provide decision-makers with a much more nuanced approach to determining an acceptable threshold and enable them to better balance business value and risk. About the Author: Paul Doman is the president and CEO of Accurate Group, a nationwide provider of technology-driven appraisal management, title data, compliance and closing solutions. For more information, visit accurategroup.com.